Gyroscopes were the top revenue generator in 2011 in the dominant consumer and mobile segment of the microelectromechanical systems (MEMS) market, thanks to record sales of Apple Inc.’s iPhone and iPad devices from during the final quarter of last year. Gyroscopes netted $655.4 million in 2011, up a notable 66 percent from $394.5 million in 2010, according to an IHS iSuppli MEMS Market Tracker report from information and analytics provider IHS (NYSE: IHS). Long a runner-up in its category, gyroscopes finally displaced accelerometers last year to become the revenue champion in consumer and mobile MEMS. 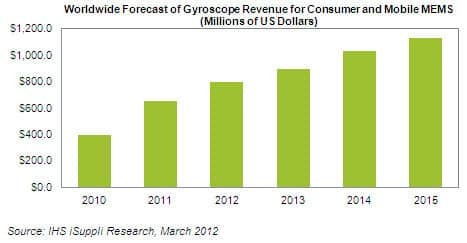 Gyroscopes will continue to reap top revenue honors in the next few years, taking in $1.1 billion by 2015, as shown in the figure below, well ahead of accelerometers at $705 million. The newfound prominence of gyroscopes means the devices last year accounted for 41 percent of revenue for all kinds of motion sensors in consumer and mobile applications including accelerometers and electronic compasses, pegged at $1.6 billion. This compared to a 24 percent share in 2010 when overall motion sensor revenue stood at $1.1 billion. The rise of gyroscopes to the top was in large part due to the boom in 3-axis versions of the device, used mostly in tandem with 3-axis accelerometers for more accurate motion sensing. While accelerometers are responsible for correctly orienting phones and tablets to the viewer’s perspective whether the devices are held vertically or horizontally, gyroscopes improve the motion-based interface, especially for gaming. Emerging applications for gyroscopes in smartphones also include optical image stabilization and navigation-related functions. Among suppliers, STMicroelectronics was the leading producer of both gyroscopes and accelerometers, with Apple accounting for half of the company’s MEMS business in 2011. STMicroelectronics is the sole supplier of gyroscopes and accelerometers for the iPhone and iPad. Moving forward, configurations known as 6-axis inertial measurement units (IMU) featuring three accelerometers and three gyroscopes in one “combo” package will dominate in the sales of 3-axis gyroscopes by 2014 at the latest. Altering the market landscape for combo sensors also is a slew of recent product announcements for surprisingly compact 6-axis compass modules comprising a compass and an accelerometer in the same package, as well as 9-axis IMUs with 3-axis electronic compasses added to 6-axis IMUs. Bosch Sensortec and InvenSense have introduced a 6-axis compass module and a 9-axis IMU, respectively, with a very small form factor. In general, motion sensors like gyroscopes, accelerometers and electronic compasses will continue to rule consumer and mobile MEMS, the largest segment of an industry that includes other MEMS sectors such as automotive, medical, industrial, and aerospace and defense. Aside from their use now in smartphones and tablets, motion sensors are seeing new opportunities emerge in areas like TV remote control applications, as well as in the super-thin ultrabook laptops promoted by Intel Corp. New generations of remote controls, such as those from California-based Roku, already include a 9-axis mix of either discrete or combo sensors—a format expected to spread rapidly. For its part, Intel is recommending the use of accelerometers, gyroscopes, electronic compasses and even pressure sensors for manufacturers of the company’s ultrabooks, even though IHS believes that the combination of gyroscopes and compasses will be present mostly in “convertible” ultrabooks—those with a screen that can be flipped back to form a tablet—and not in all Ultrabooks. By 2015, both TV remote control and ultrabook applications will add another $155 million in revenue derived from the use of accelerometers, gyroscopes and electronic compasses, up from a mere $9 million in 2011. Based also on their use in the iPhone and iPad, MEMS microphones likewise saw rapid growth last year in consumer and mobile MEMS. Apple uses two analog MEMS microphones in the iPhone 4 and 4S, along with one MEMS microphone in the headset that is sold with the phone. In addition, one digital MEMS microphone is present in the iPad 2. MEMS microphones are particularly important for noise suppression when using the Siri voice command feature in the iPhone 4S. All told, revenue in 2011 for MEMS microphones reached $373 million, up 67 percent from $223 million in 2010. Knowles Electronics still dominates the MEMS microphone sphere, but its share of shipments in the overall market has fallen from 88 percent in 2010 to 75 percent last year. Several suppliers had a breakthrough in 2011, and there are now eight suppliers that each produce more than 10 million MEMS microphone units, up from just three in 2010. In another area, MEMS oscillators recently saw a surge of interest arise in the space with the entry of three big players. Murata, an established supplier of ceramic oscillators, acquired VTI Technologies in October last year. Meanwhile, IDT—the leading manufacturer of complementary metal-oxide-semiconductor (CMOS) timing, introduced its first MEMS timing product in November, as did NXP—a supplier of real-time clocks—during this year’s Consumer Electronics Show in Las Vegas. Such developments will help boost the credibility of MEMS as a viable alternative to quartz in the timing area, IHS believes.